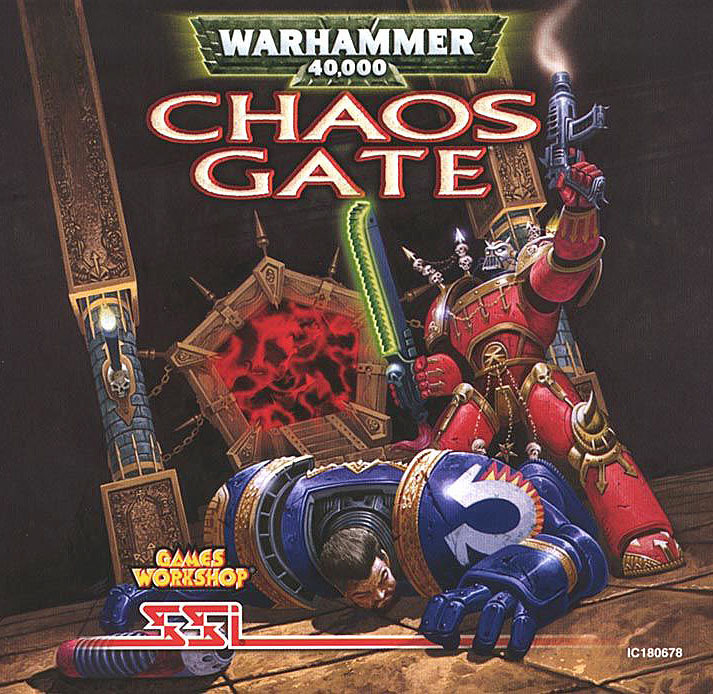 Warhammer 40,000 Chaos Gate was a turn-based strategy game published by SSI. 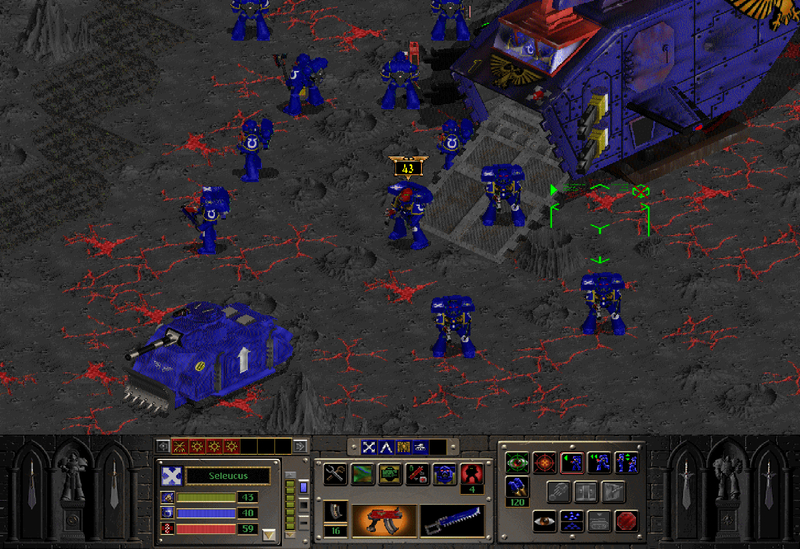 It was their second licensed Games Workshop product back in 1998, after the epic Final Liberation. Chaos Gate got re-released on GOG and is available for around 9 EUR, incl. 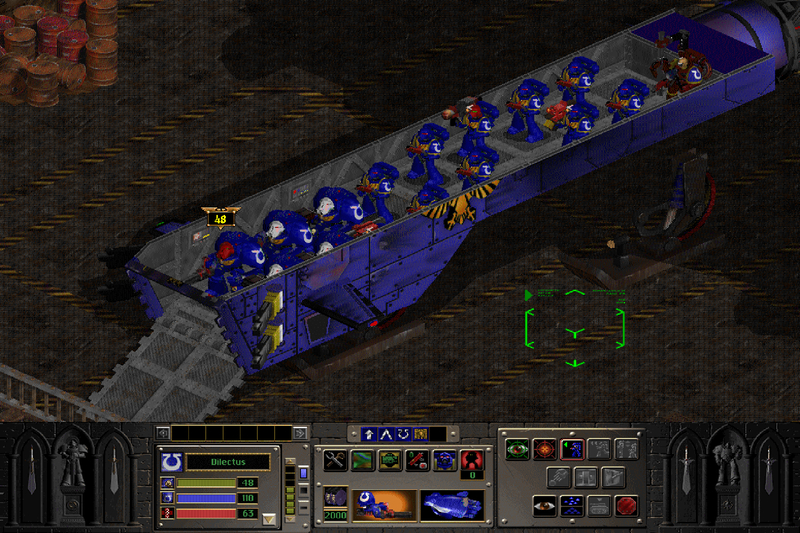 Windows 7 to 10 support, along with an updated version of Final Liberation and Shadow of the Horned Rat. 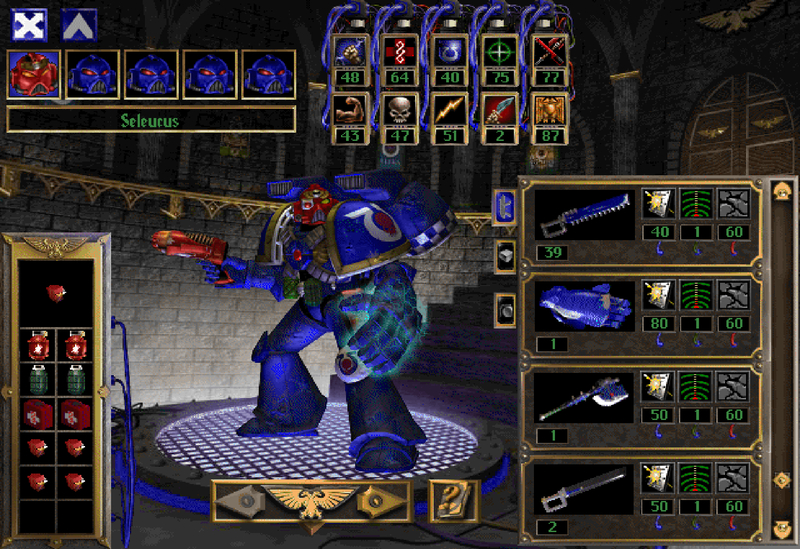 Those games were released 20 years ago, so just to give you a brief throwback to those time, here a couple of screenshots. But let us get back to the terrain kit. It comes in a large box and sets you back 40 EUR. 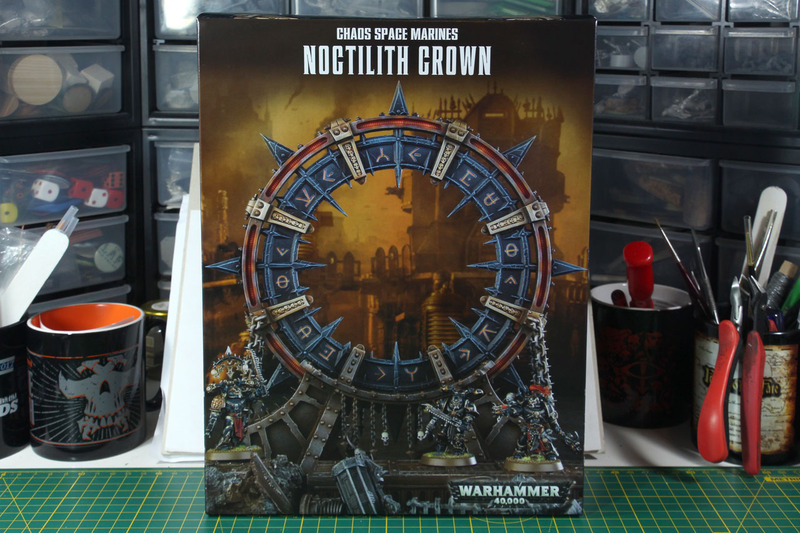 The box contains two large dark grey sprues and a large roughly A4 sized assembly guide, including the rules for the terrain piece. This is the first time that I saw a rules entry in mandarin / chinese. 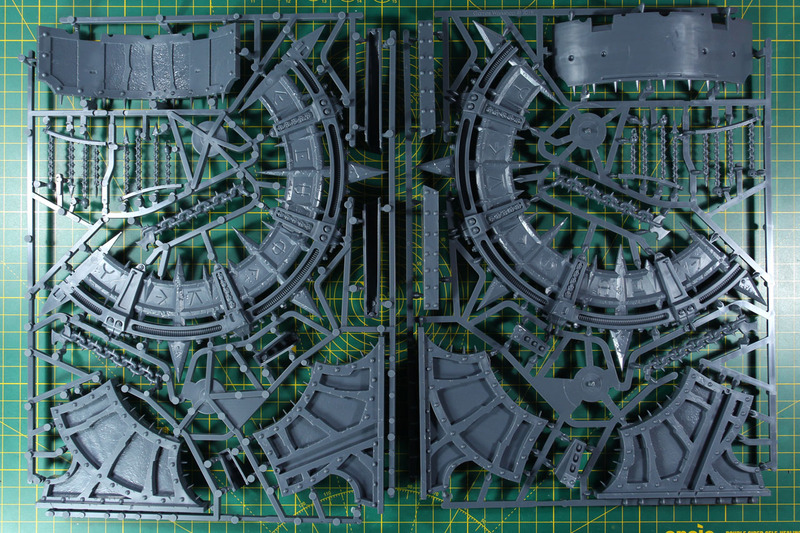 The kit consists out of the same sprue two times. 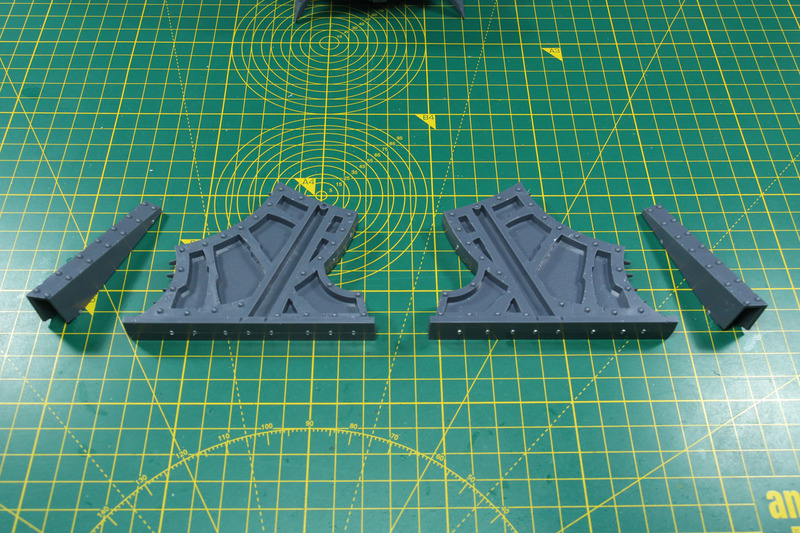 Which is not unusual with the terrain pieces. 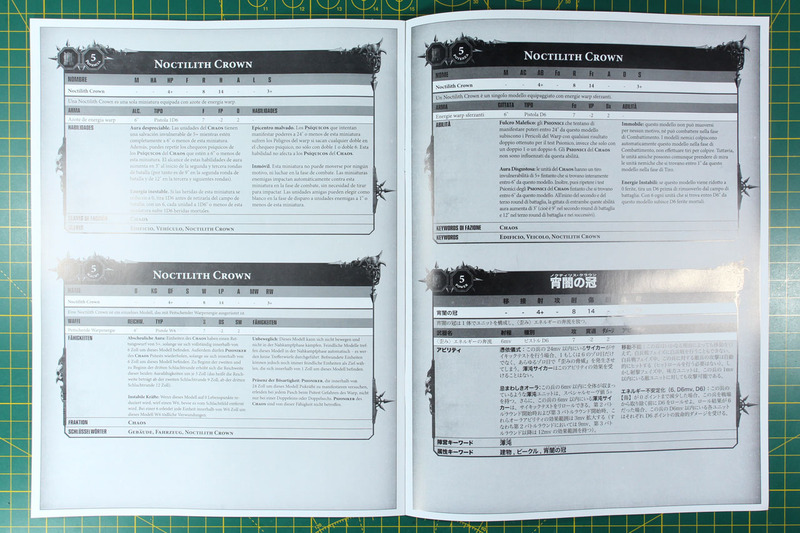 The Noctilith Crown is produced as many other terrain items in China (not a bad thing, LEGO does that too). 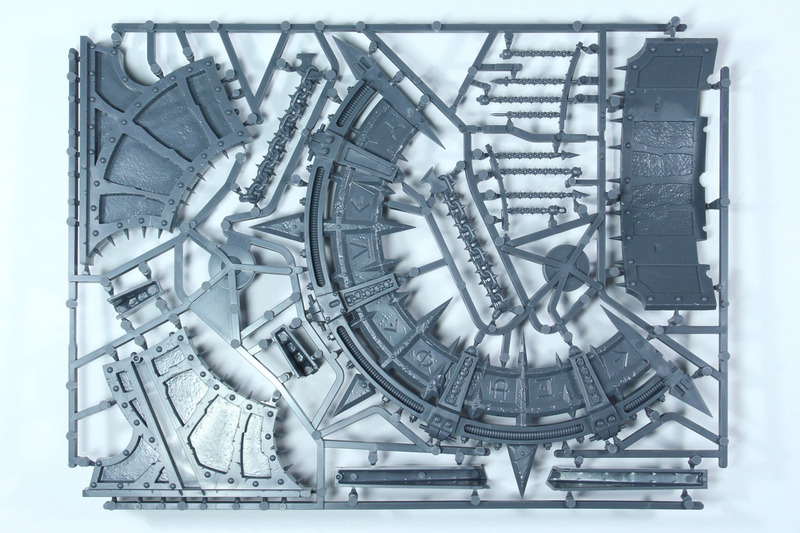 Usually these terrain sprues are a bit more "crude", for example the connections to the sprues are usually a lot more compared to the finer kits from the UK and the parts are bigger / thicker (it's terrain, remember). 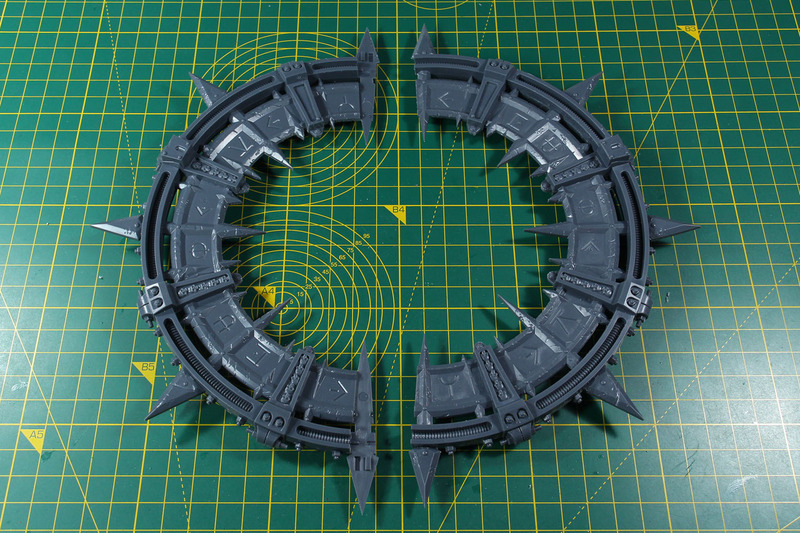 So sometimes removing the parts and cleaning them afterwards costs quite a lot of time, like with the Sector Fronteris ruins. But here it was quite moderate and easy to do. 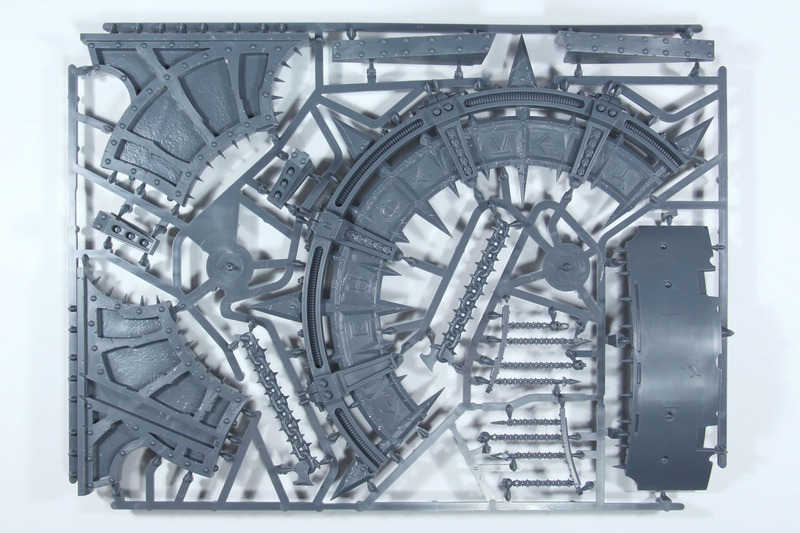 The sprue is packed with a high density and the sharpness of the details is good. 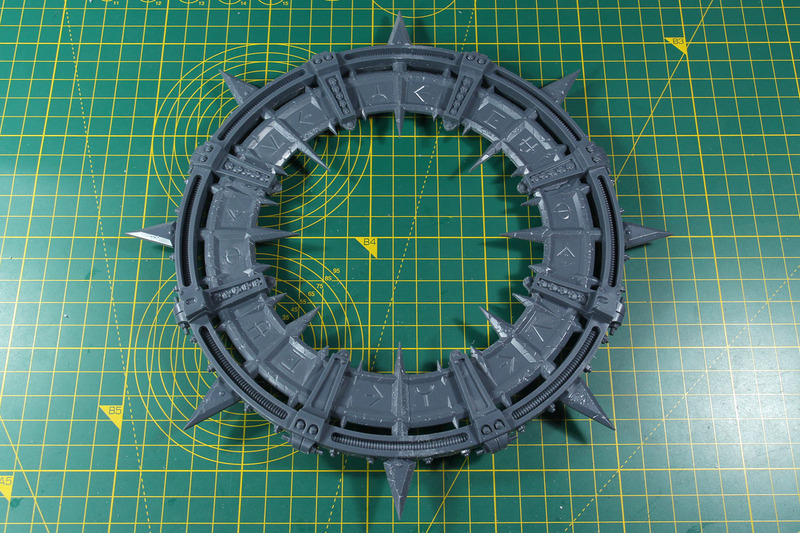 Main part of the Noctilith Crown is the large gate itself. It is assembled by two identical pieces and spots chaos runes. These spell "Ar-Gz-Ul-H-Ak-W-Ar-Y" in the dark tongue, two times on each side. 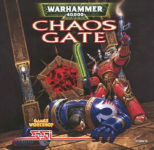 The "translation" was taken from the chaos runes from the 6th edition Warhammer Armies supplement Hordes of Chaos. So there is no further easter-egg (or at least I don't got it). 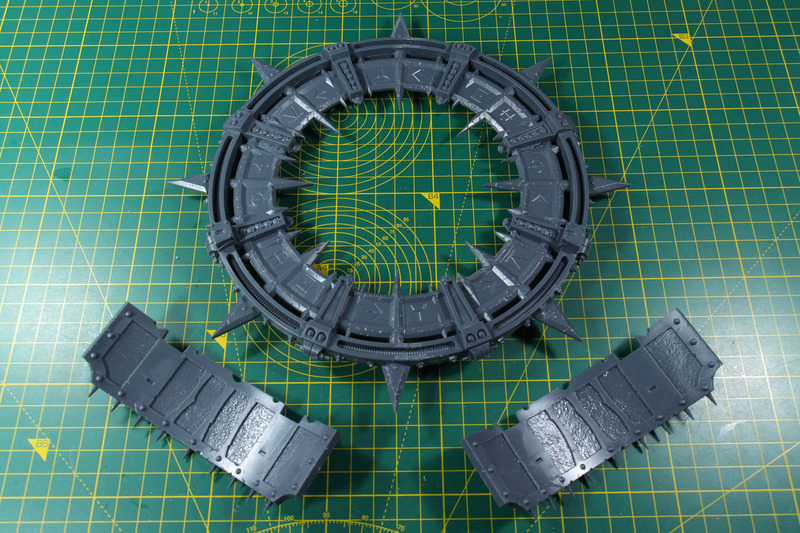 The gate itself has a rounded plate on both side that forms the base and connects the further pillars / foundation in the next steps. These angled pieces are included two times, one set for left, one for right and added mirrored to the front and back. The bottom of these is slightly angled as well, but the Crown stands stable. 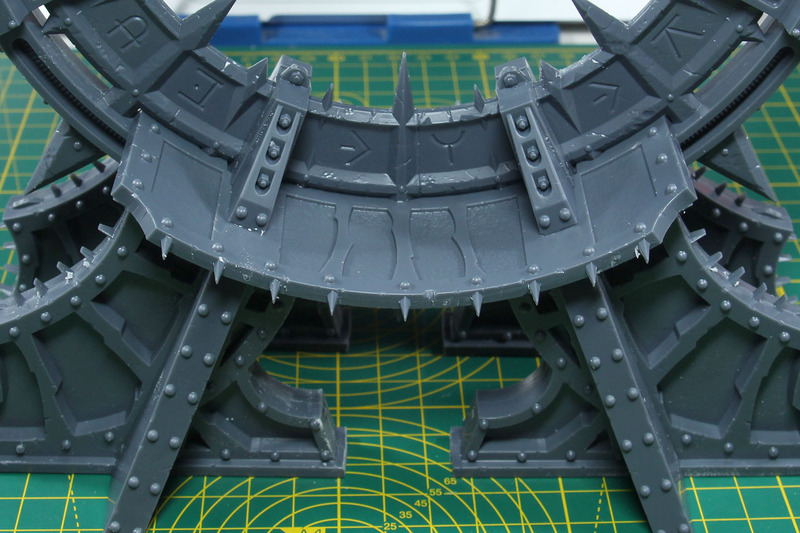 Smaller pieces prolong the frame on both sides of the gate, giving the main gate a more stable stand. 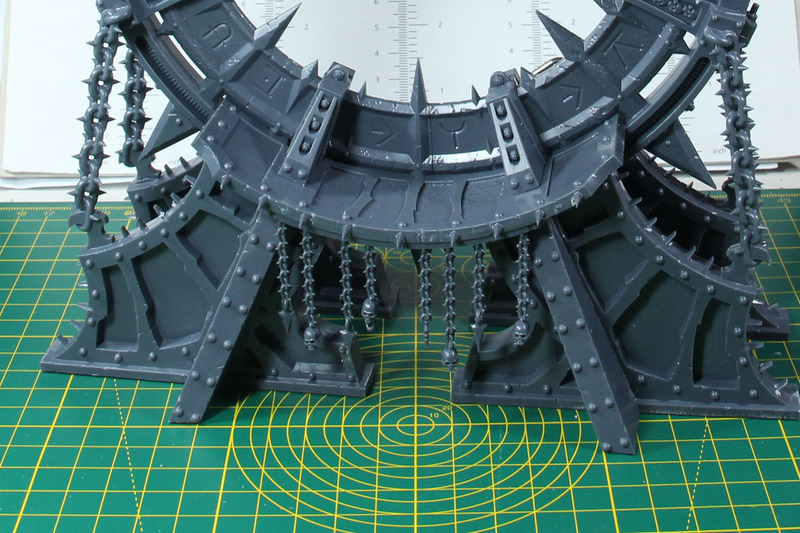 Next up big chains to hold the gate in place. 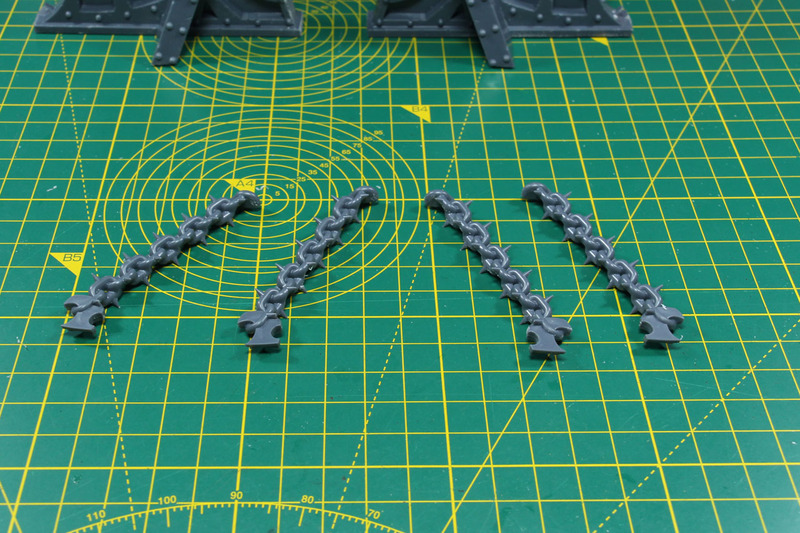 Chains are rather difficult to cast in plastic, as you have rounded pieces and undercuts, so you either have to cut back on the detail of the bits or make a more complex, time consuming mould. 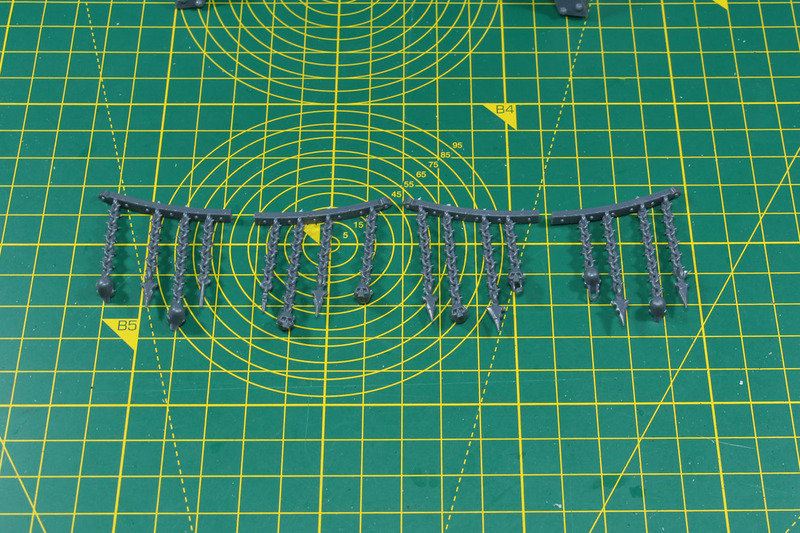 In this case reducing the details and making the chains more bulky wasn't a bad choice. 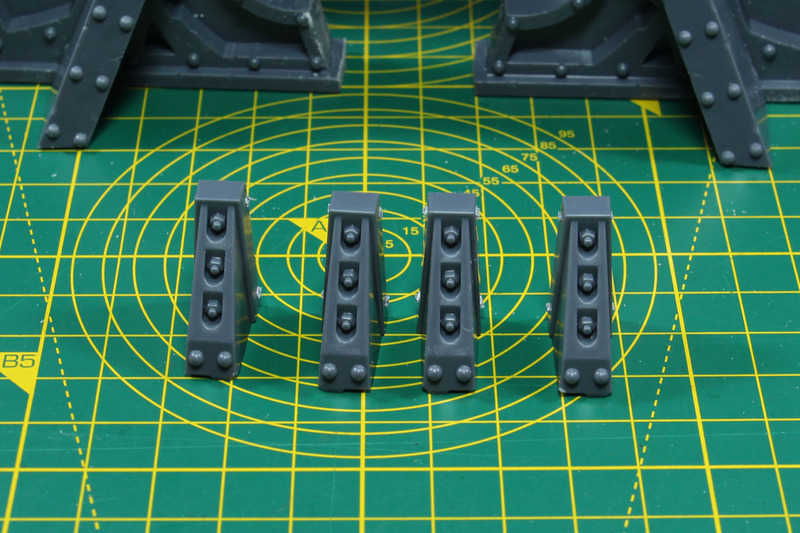 It makes them look quite sturdy and with the spikes they still have a very plastic form. 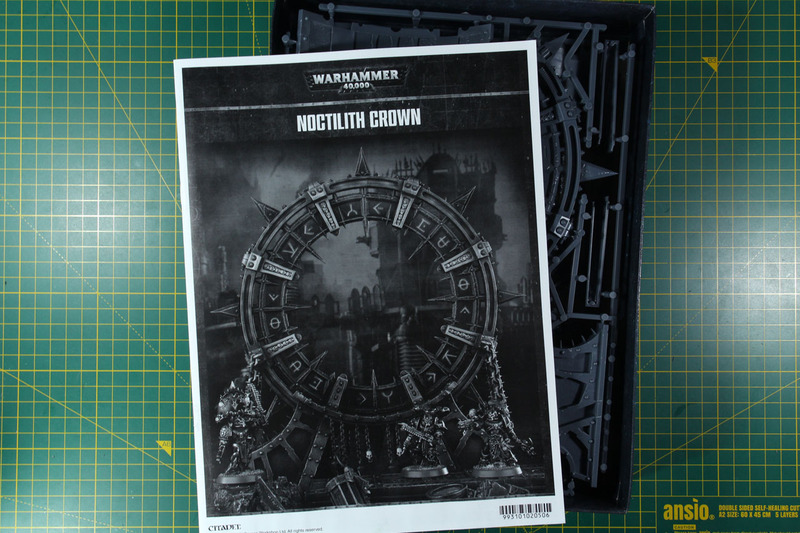 And the last bit for the Noctilith Crown, as we're still in Warhammer and of course with chaos, some skulls. These go on both sides and are mirrored, so you don't see the duplettes. 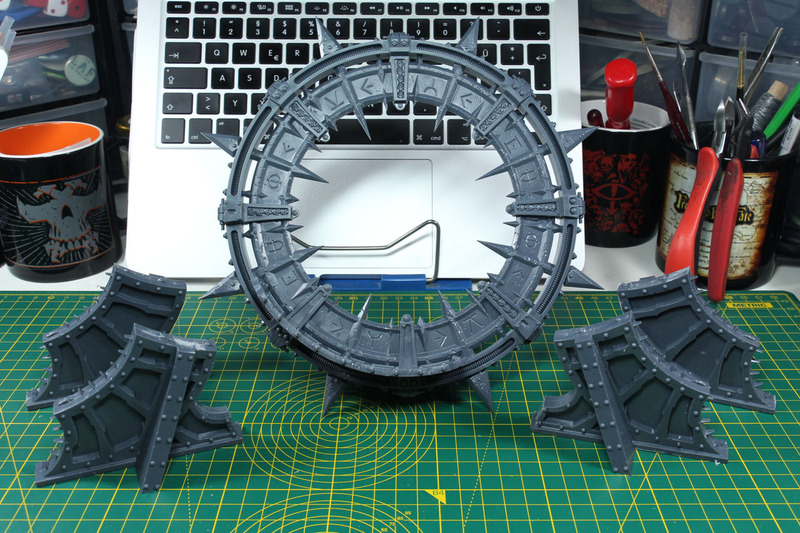 That's it, the terrain piece is assembled and ready to get painted. As for the size, this thing is huge! 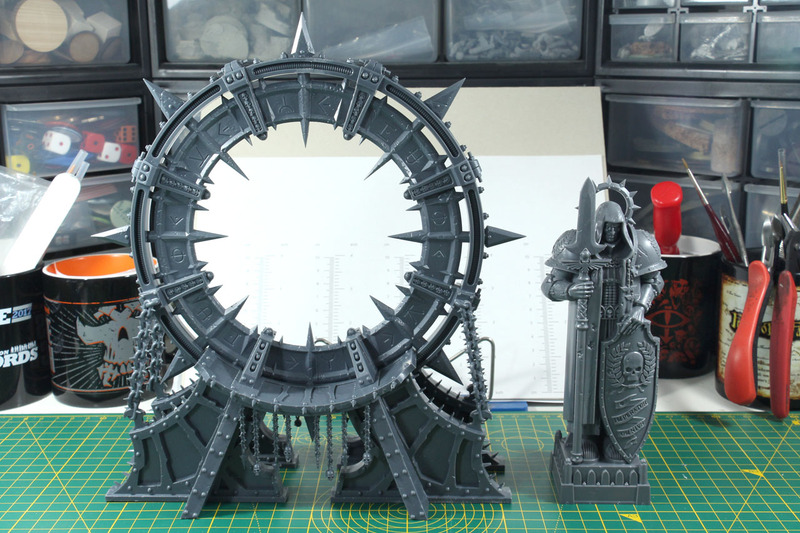 Just look how it towers over the Chaos Space Marines or stands next to the statue from the Imperial City kits. So a very present piece on the table, without being to large. This one caught my eye from the first time I saw it on Warhammer Community. Impressive design and size. 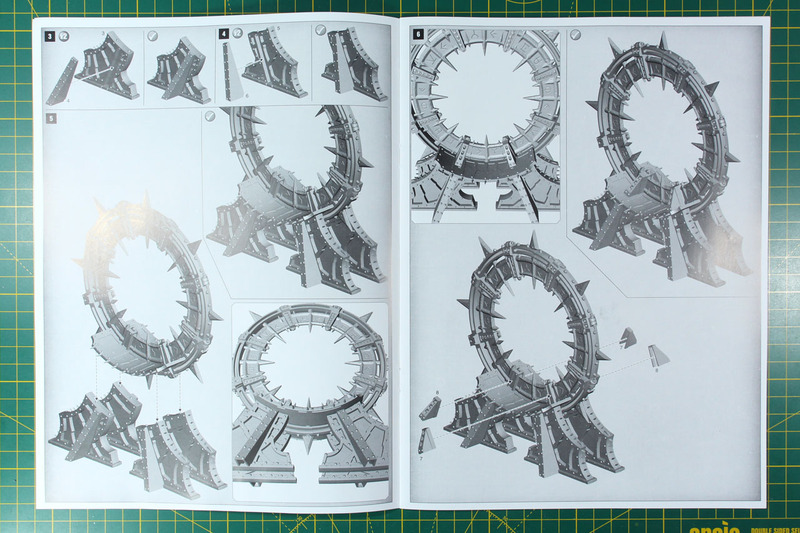 And when you build it, which goes faster than you might think (at least I was amazed how fast this one assembles), you see the sheer size of it (as it is after than you expect it). 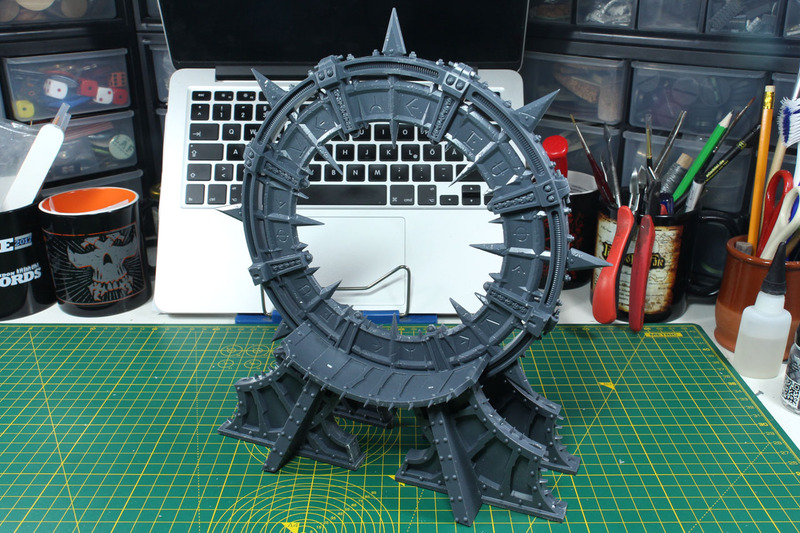 At first I thought, maybe this is missing is a staircase or flat plateau, but as mentioned above, this isn't meant as a gate or portal, this is a cult shrine to Chaos in form of a circle. 40 EUR isn't a bargain, but reasonably priced. 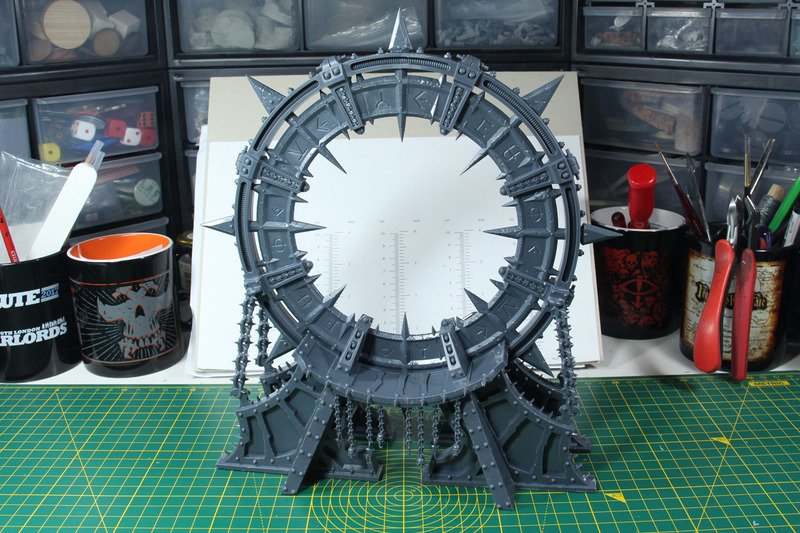 There are similar star gates available from resin or MDF for about half the price, but these are usually half the size or smaller and by far less impressive. 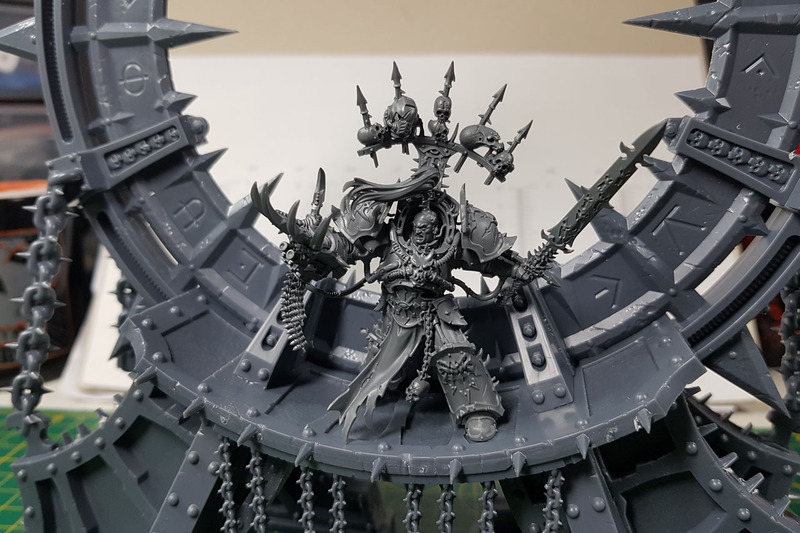 Design is well done, not too over the top but well done and fitting - not only for the grim dark. 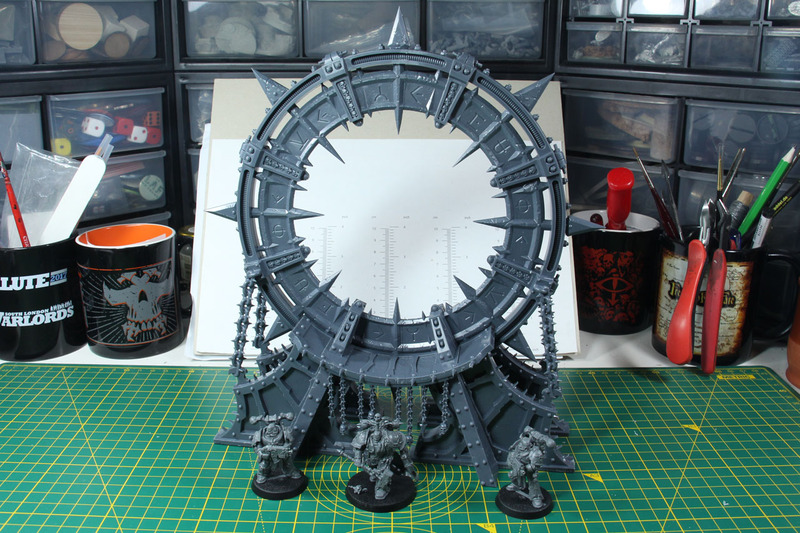 I can see this in multiple settings within Warhammer 40k, for Inq28 and Necromunda of course, and for some Pulp Settings as well. 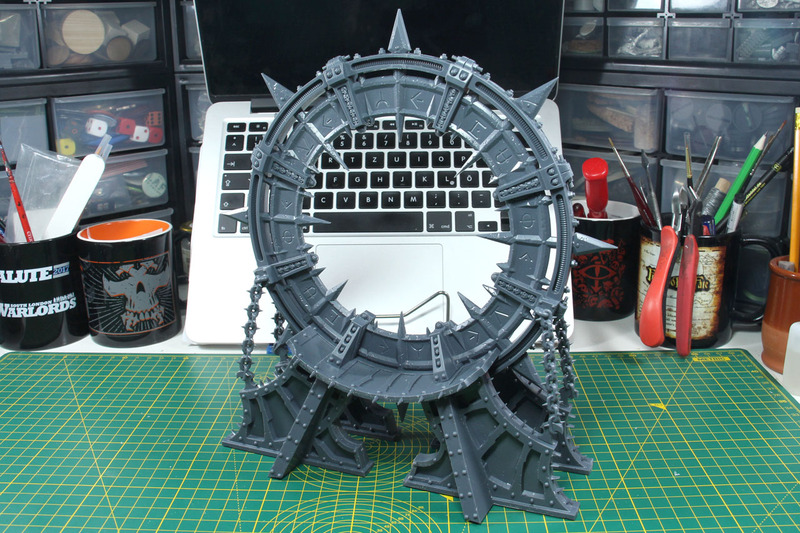 Even as this isn't a portal or gate in the way it is introduced, I can still see some missions using it like this, inspired for example by the Dark Portal from Warcraft, with waves of Chaos Daemons or Chaos Space Marines moving onto the board through this and the enemy has to try to destroy the gate (would work great with Eldar or Daemonhunters). The kit bears a lot of conversion potential. 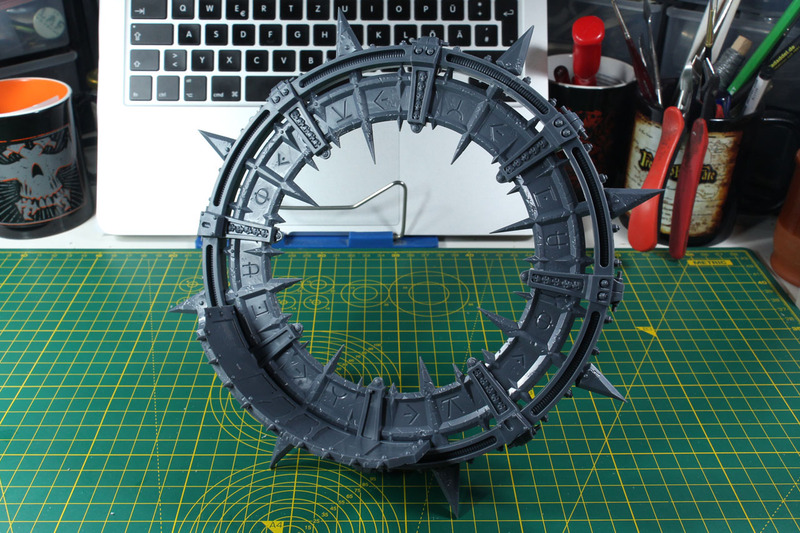 You could put the crown flat on the surface and fill it with a pool of Blood for the Blood God, or put it on top of a Baneblade. 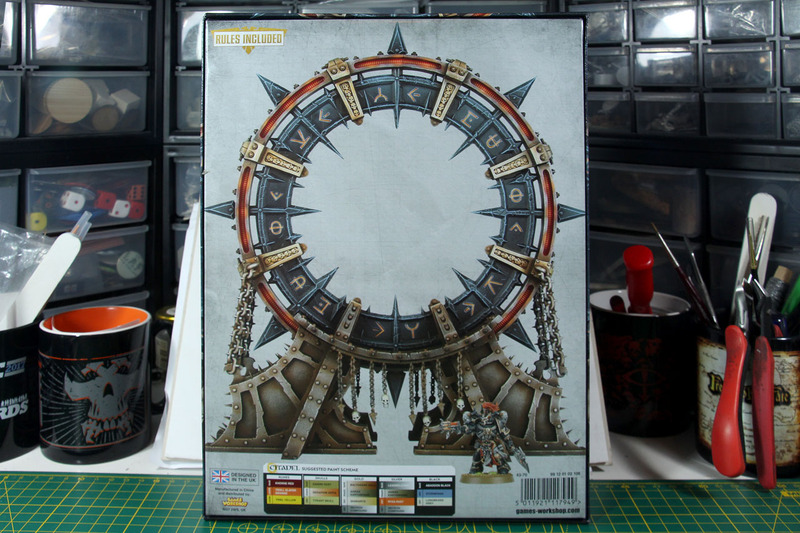 With the updated Apocalypse around the corner, who knows what crazy, huge icons of Chaos that supplement will bring.